Cubis Casual Slot Game Guide & Review - Casino Answers! 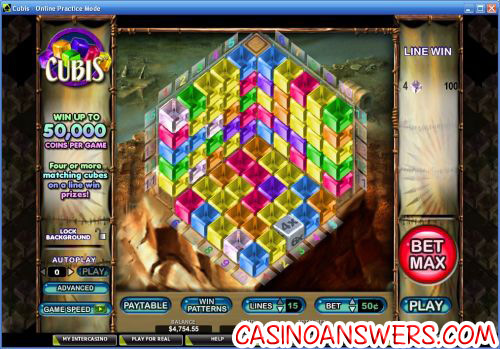 Cubis is a 15-line casual game slot machine with wilds and multipliers developed by Cryptologic. You can play Cubis at Cryptologic online casinos like InterCasino and Random Logic casinos like Lucky Ace Casino. For the purposes of this review, in case there is any variation, we will be reviewing the game on the Cryptologic gaming platform. Cubis is based on the online game of the same name. In the true online game that you can find on Flash game sites such as Yahoo Games, there are a bunch of cubes on a 3D board. You are given cubes to add onto the board. You must match 3 of them to remove them from the board. In the online casino slot version, all you have to do is hit the “Play” button and the game will generate a full board of 75 cubes on two faces. A winning combination occurs when 4 or more (up to 10) cubes match. The game will then remove the matching cubes from the board. When cubes are matched and removed from the board, new cubes will be added. If they happen to match with the cubes already on the board, they will be removed as well. For a similar casual game slot, please read our Bejeweled Slot Review. Playing the Cubis video slot is simple. Start by setting your bet per line ($0.01, $0.02, $0.03, $0.04, $0.05, $0.10, $0.15, $0.20, $0.25, $0.50, $0.75, $1 followed by increments of a dollar all the way up to $20). Cubis gives players a very extensive amount of betting options, making it ideal for low or high stakes players. You can bet as little as a penny per game and as much as $300 per game. Once you have your bet ready, you can hit “Bet Max” to play all 15 lines or hit the “Play” button to play at whatever settings you have set. When you get a winning combination on the Cubis casual game slot, the cubes will be removed from the board. The cubes from the above line will fall down in their place. New cubes will then be added to the board and can generate another possible winning combination. If you’re lucky, you can get many consecutive wins on one game of Cubis! Much like different symbols on a slot machine, each coloured cube in Cubis has a different value. The colours are ranked in this order: Diamond, Green, Blue, Purple, Red, Orange and Yellow. 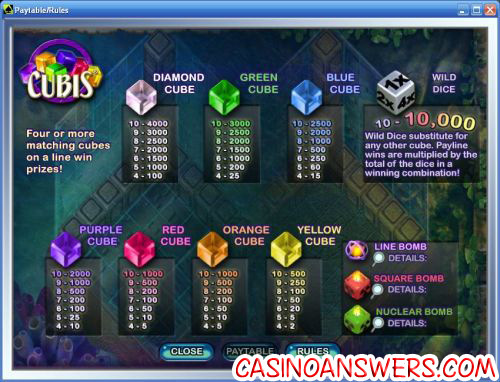 There are other cubes on the Cubis casual game slot machine besides the coloured cubes. There is also the Wild Dice cube. The Wild Dice cube is the wild symbol and will substitute for any other cube. The Wild Dice cube will have a multiplier on it, which will multiply your winning combination for even bigger winnings. Using the Wild Dice symbol, you can win the Cubis top jackpot of 10,000 coins. It doesn’t end there… There are more special cubes that come up on the Cubis slot! The Line Bomb shoots balls of fire in four directions, destroying cubes at 90 degree angles on the same face of the board. Destroyed cubes will be replaced, creating more chances to win. The Line Bomb will not explode until there are no more winning combinations. Another special cube in Cubis is the Square Bomb. The Square Bomb will destroy all of the cubes on the face of the board where it is located, allowing for new potential winning combinations and more chances to win when the cubes are replaced. The Square Bomb won’t detonate until no more winning combinations remain. If you thought the Line Bomb and Square Bomb were something, even better is the Nuclear Bomb. The Nuclear Bomb will destroy all 75 cubes on the game board. This will give you the most potential opportunities for winning combinations. Cubis has an autoplay mode for players who like to play lots of games without lots of clicking. In it, you can set the number of games (from 1 to 999) and to stop when you have a cumulative win or loss of up to $5,000, a single win of $5,000 or to stop if you win the maximum payout. You can stop autoplay at any time. Does Cubis moves too slow for you? No problem, you can change the game speed. There are Normal, Fast and Very Fast speeds available. We prefer the Normal speed, as the Cubis casual slot has some great animations and sound effects that we enjoy. If you’re tired of the same old slot machine and video slots, we think you might enjoy the Cubis slot game. It’s more like playing a puzzle game that you can win money on than playing a video slot! There’s also quite a large top jackpot of 10,000 coins that will make most online casino players interested in at least trying it. If Cubis wasn’t exciting enough already, you can get a 100% up to $225 signup bonus to try this unique game out at InterCasino! Are US players able to play the Cubis slot machine? Unfortunately, neither Cryptologic nor Random Logic online casinos are taking US players at this time. For an exciting alternative, US players sign up at Vegas Days Casino and play their interactive slot machines called iSlots. Do I need to download any software to play Cubis? InterCasino has a no-download Flash casino in addition to the software that you can download. This is great for Macintosh users as well as players who don’t wish to download any casino software. If you have any problems playing the Cubis Flash slot machine in your browser, make sure you have the latest version of Adobe Flash Player installed on your computer. Does the Cubis casual game slot machine have a progressive jackpot? No, Cubis does not have a progressive jackpot. What Cubis does have is a 10,000 coin fixed jackpot, which means you can win up to $200,000 playing Cubis at InterCasino. Where could I play a bejeweled casino game? What casinos offer games similar to Bejeweled?